“High Time,” Grateful Dead. Circa 1970. Very touching country-rock kind of song about a misunderstanding that ended a relationship, and all the self-doubt that followed. Melancholy. Goes where you wouldn’t expect: surprise. Beatles – used a lot of harmonic surprises, putting in a different chord/progression than would be expected. Lennon/McCartney have more #1 hits in history 100 than anyone else. Period. We’re not looking to create entertainment the same way a songwriter or a screenwriter is. But on the other hand, we don’t want our copy to be boring. People have, generally, humdrum lives. Effective in either case because, people like to be nudged out of their humdrum lives. And as copywriters, we need to stimulate emotion in our prospects in order to make them receptive to taking action – i.e., buying. 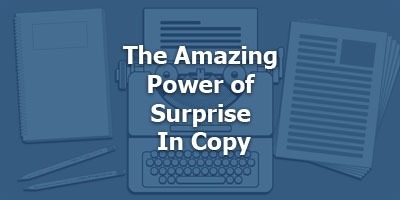 So how do we use surprise in copywriting? In 1976, this is quite a surprise. Today, it’s no big deal. But we have to look at copy in the perspective on when it was used. John likes to use colorful verbs. Cram. Stun. Maim. Crush. Coax. He has a rule that is hard to follow but well worth it if you can do it skillfully: Never use the same verb more than once in a piece of copy. One exception: Don’t put in a lot of synonyms for “said.” It doesn’t sound natural or conversational when you say things like, “He elocuted,” or “She intoned.” It sounds contrived. “Said” and “Asked” are usually all you want to use. 3) Imaginative but easy-to-grasp metaphors and comparisons in stories and bullets. Stuff people don’t expect. Exciting, unexpected images – but nothing too hard to grasp. Making more money than the pharmacist who’s running a meth lab on the side. 4) Surprising pricing / terms. Gary Halbert story – Guthy-Renker – don’t pay for 30 days – tripled response.